First-time buyers often tell us: "I just want to buy some gold bullion. I'm not interested in coins, yet what I see offered everywhere is gold coins. What's that all about?" For years, we have heard this comment from many of our clients. Basically, this is a misunderstanding of what bullion is. The common perception is that rectangular bits of gold "bars" are the most cost effective, and perhaps the only available, form of gold bullion. The same thinking has it that round bits of gold "coins" are limited in supply, expensive, and perhaps, to some extent, collectors' items. When you go to buy gold for gold's sake, what you are looking for is bullion. Bullion is a recognized weight and fineness of gold that you can purchase for the current price of gold, plus the small percentage costs incurred in refining, fabricating, and shipping that bullion to you. The word 'bullion' has a very simple definition: it is simply a refined and stamped weight of precious metal. Our traditional view of gold bullion is the large gold 'bricks' that we imagine are stored in Fort Knox and, sure enough, much of the world's bullion gold is in the form of refined gold in large bars, held in central bank storage. These are the "London good delivery" bars of approximately 400 troy ounce size, refined and cast by the various private refiners worldwide, and accepted for 'delivery' into London and other major gold markets. These large bars are an efficient way to trade physical gold, but they're best left in the care of a registered storage facility. However, if you have an actual use for the gold, they can be the most cost-effective way to buy it. They're useful, for instance, if you're going to make something that requires about 28 pounds of gold as a raw material. But if you don't actually make use of them, these bars can be costly to liquidate once removed from storage. You may encounter assay, refining, or just handling fees in trying to liquidate that size bar. It's much more difficult and time-consuming to liquidate a chunk of gold that is worth over $100,000 than it is to sell the same amount of gold in more convenient and trad-able sizes. Smaller bars of gold in sizes from the tiny 1-gram jewelry trinkets up to 32.15 ounce kilogram bars have also been poured by various refiners around the world. These are very popular in the retail gold bullion market worldwide, particularly in parts of Europe, the Middle East, and Asia. Buying gold in bar form gives people around the world a way to build wealth without depending on the changing value and acceptance of the local currency. For people everywhere in the world, a gold hoard is a private and permanent hedge against many possible contingencies. Today, in North America and other parts of the world, gold bullion 'coins' backed and guaranteed by their issuing government are the most popular form of traded gold. How did that come to be? Of course, gold coins have been used in trade for thousands of years. The concept of a government-guaranteed measure of gold was what originally gave 'money' its power and legitimacy. But with the end of circulating gold coins in the world during the 1930's, gold lost its link with everyday currency, and people began to think of gold coins as collectible artifacts from our monetary past. "Gold coins," no longer produced as money, came to be considered something scarce and obsolete. All that changed in 1967 with the introduction of the gold Krugerrand. That year, South Africa introduced a radical idea in bullion: Government-issued gold bullion in convenient one ounce form, "gold coins for the people," struck in unlimited quantities, and distributed at the current spot price of gold plus a small percentage. By assigning these coins a nominal face value, their legal tender status avoided the restrictions, duties, and taxes that many countries levy on raw gold bullion. Now, these gold coins have come to dominate the U.S. gold market, mostly in the form of bullion coins containing exactly one troy ounce (31.10 grams) of pure gold. 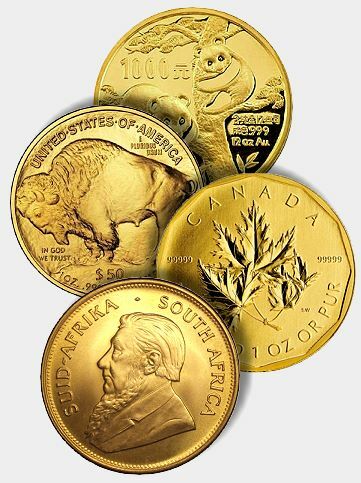 South Africa pioneered the 'round bullion' concept, but they were followed by Canadian Maple Leaf, Chinese Pandas, and, in 1986, the U.S gold Eagles. Since then, countries such as Australia, Austria, Great Britain, and Singapore have also issued such coins, with varying degrees of success. But each coin has the advantage of guaranteed purity, exact weight, and total liquidity worldwide. If you want possession of bullion gold, your best bet is the guaranteed bullion coins issued by the various world mints. In the U.S., American gold Eagles are probably your best choice, although Canadian Maple Leafs, South African Krugerrands, Chinese Pandas, and Australia's bullion coins each have much to recommend them. Although we have access to the larger bars if a customer just feels like having enormous blocks of gold, we strongly recommend that our clients purchase the bullion coins, even if purchasing hundreds or thousands of ounces of pure gold. Gold bullion coins in the last twenty years have become the most liquid, divisible, and accepted form of gold bullion worldwide, and they enjoy a much more favorable 'spread' than bullion bars. In the U.S., they are simply the smartest way to buy gold if you are going to take physical possession of the bullion yourself. Lets take a look at the most commonly traded bullion gold coins. Click on the links below for detailed information on individual bullion coins. 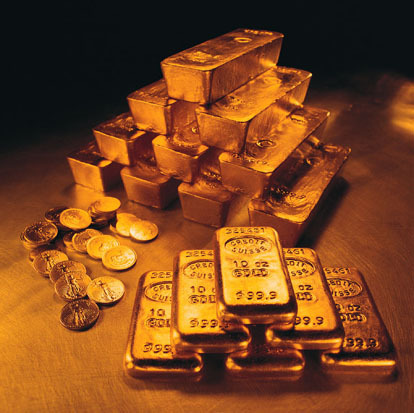 Prior to the advent of bullion coins, bars were the only way to acquire gold bullion in pure form. Although not as popular as they used to be, gold bars are still a very good way to acquire bullion. Available in 1oz, 10oz, 100 grams and kilo (32.15 troy oz) sizes. Click here.. for detailed information on available gold bars. Another way of buying gold in bullion form is the former gold coinage of various European countries. These are the legal tender gold coins that circulated in these countries dating back from the late 1800's thru the late 1900's. These vary in size and weight from 1/10oz to 1.2oz per coin. They have the added advantage of having smaller premiums when buying, than bullion coins and are also very liquiid when selling. Click here for more info..
Bullion coins offer one of the easiest and least expensive ways to acquire gold. There are a vast array of choices for obtaining gold ranging from U.S. produced to countries minting gold coins from around the world. Bullion coins enjoy a very liquid market and are the ideal way to acquire physical gold. Bullion gold coins are available in a variety of weights from 1/10 oz, 1/4 oz, 1/2 oz as well as standard 1 oz sizes. This makes them ideal storehouse of value. Numismatic Assets offers a variety of bullion coins and bars for your consideration, all available for immediate delivery. Call us for up to minute buy/sell prices on any bullion coin/quantities you have an interest in. Note: Due to current market conditions, prices are subject to change and some items may not be available!